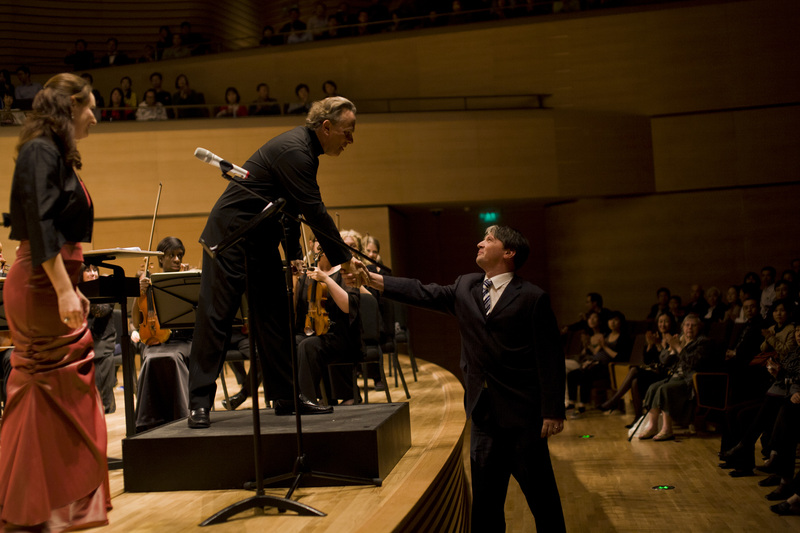 Sir Mark Elder and the Hallé Orchestra concluded their historic first tour of China yesterday with a triumphant performance at the Tianjin Grand Theatre, part of the theatre’s inaugural season. For their last concert in China, the Hallé programmed works with a particularly English flavor: Vaughan Williams Fantasia on a Theme by Thomas Tallis, Britten Young Person’s Guide to the Orchestra and Elgar Symphony No.1. During the first half of the concert, the Hallé was joined by English soprano Elizabeth Bailey to perform the world premiere of an orchestral art song by English composer Andrew Webb-Mitchell, The Inspiration of Night. The Hallé, of course, are no strangers to giving world premieres by English composers. In 1908, they gave the first performance of Elgar’s first symphony under Hans Richter and in 1953 the orchestra premiered Vaughan Williams Sinfonia Antartica. On this occasion, Webb-Mitchell’s art song was given star treatment by Sir Mark Elder, bringing out much of the song’s delicate orchestral contours before shaping the music into a breathtaking climax. Soprano Elizabeth Bailey was in equally fine form, soaring above the orchestral pyrotechnics with a bright and insightful reading of Joanna Boulter’s text. The Hallé tour was sponsored by the Manchester Airports Group (MAG) and UK Trade and Investment, in a bid to promote business in the North West region. The concert at the Tianjin Grand Theatre was attended by the British Ambassador to China, Sebastian Wood.